Product: Exterior siding using the Ranchwood product line in two color, Western and Tackroom, with circle sawn texture. The Barn Red color is a custom color with skip sawn texture. 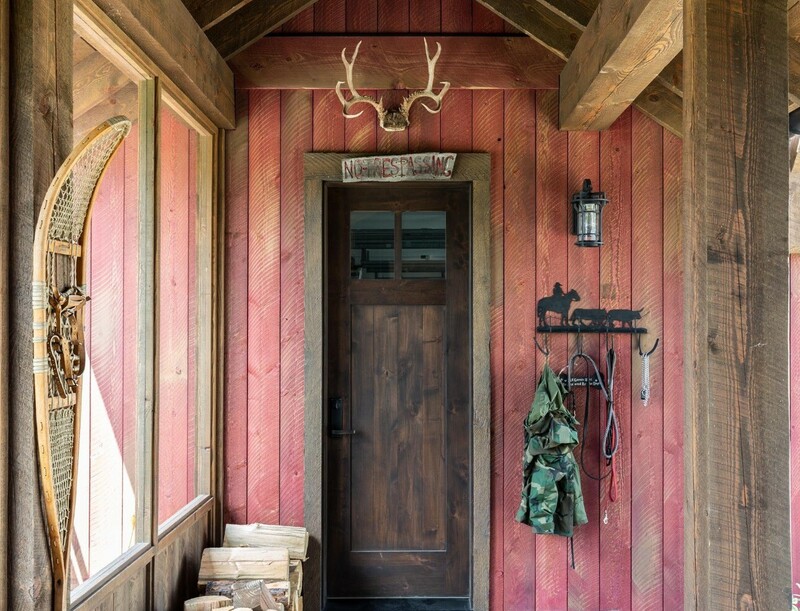 Product Use: Vertical siding is shiplap profile, trim and corners are a square edge profile. The horizontal siding is a custom reveal profile. The barn red is vertical shiplap with square edge material for trim and rafters. The wood is sealed on all sides with the Seal Once product in a controlled environment. Staining and sealing in a controlled mill help to insure the wood is protected from water and weather. Montana Timber Products is a specialty wood products manufacturer of rustic, modern and contemporary wood siding, interior accents, reclaimed wood, and barn wood alternatives. Our ranchwood™, AquaFir™, Charwood™, and Corral Board product lines offer a full selection of exterior and interior wood materials. All the products can be used for residential and commercial application. Each product line is offered in two wood species, Douglas Fir and Cedar. Seal Once offers high performance long lasting waterproofing seal that is environmentally friendly non-toxic protection. Selling direct to the customer and custom milling each order allows Montana Timber Products flexibility to create your project. Call 877-513-9553 or fill out a contact form at: http://www.montanatimberproducts.com/contact/ to get product information.